Google’s been talking about non-destructive, mobile/Web photography for a long time, but until now the benefit has been mostly theoretical: You could apply edits to your images, but you didn’t have an interface for adjusting edits or moving them among images. Check out the newly upgraded G+ editor (i.e. 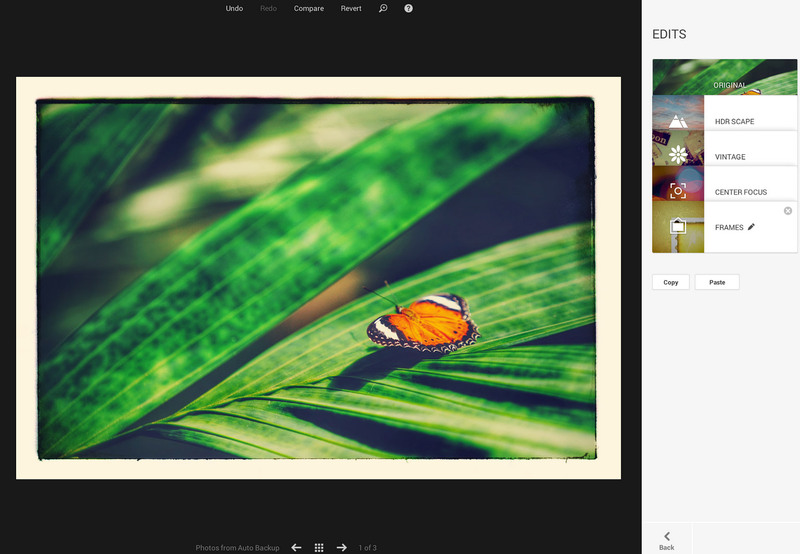 Snapseed for Mac/Windows in all but name) shows the adjustments applied to your image, letting you adjust each one, delete them, and copy them from image to image. Open an image in the Google+ Web editor. Apply one or more edits (for example, choose Black & White and then add a frame). Click the “Edits” button in the lower-right corner. Note that each step you’ve applied appears in the list. To change the settings of any step, click its name in the list, then click the pencil icon. To delete a step, click its name in the list, then click the X icon to the right of the name. To copy the appearance you’ve applied on one image to another, click the “Copy” button underneath the list of edits, then use the arrow icons beneath the main image to move to another image, then click “Paste edits” (or “Paste” if edits already exist on the image). The other interesting thing is that we’re starting to analyze images & then apply editable sets of adjustments. To start we’re detecting certain landscape & urban shots, then applying an interesting combination of blurs, HDR effects, and frames. I think that the combination of computer vision (being able to identify & classify image content) + application of style + editability is really promising. Adobe Extension Builder and Creative Cloud 2014. Jonathan Ferman points out that an HTML-based Kuler panel is available via the Adobe Add-Ons site. I’ll be showing some really interesting photo editing developments & answering audience questions on Scott Kelby’s show, starting just after 4pm Eastern/1pm Pacific this Wednesday. See you there! Having started my career as a Web designer before joining Adobe, I’m so pleased to see folks like Stephen Nielson, Tim Riot, Bradee Evans, and many others really championing the needs of designers. Onward! HTML has now replaced Flash as the mechanism for extending Photoshop & other Creative Suite apps. This plan has been public since last fall, and with last week’s CC 2014 release, the change has come to pass. Homeless Fonts works with homeless people from the streets of Barcelona to translate the handwriting they use on their signs into typefaces. The hope is that advertising agencies and corporations will use license the resulting works, with the proceeds going back into programs to help the homeless. The results are often distinctive and quite elegant. …without losing any files or visual quality. 1.5GB of storage is now down to 500MB. In Lightroom select some raw files. Choose to delete the originals (scary sounding, but it shouldn’t be). Oh God, can it be? Illustrator finally supports smart rectangles!? I’ve been fooled more than once before, but after 27 years AI has at last matched the shape-modifying chops of everything from Photoshop to PowerPoint. All good-natured ribbing aside, this should make interface designers seriously happy. Here’s a practice file & exercise.